Summer tomatoes are starting to arrive, which means its finally time to switch from cooking with canned tomatoes and using the fresh ones. My first use of this year's crop involved roasting tomatoes. I bought 6 lbs. of beautiful big red tomatoes from my farmers market and roasted them in two batches (so yes, there will be a second roasted-tomato recipe soon). Roasted tomatoes have such incredible flavor, both sweeter and more savory than a fresh tomato, if that makes sense. Roasting concentrates a tomato's sweetness while also caramelizing it a bit. 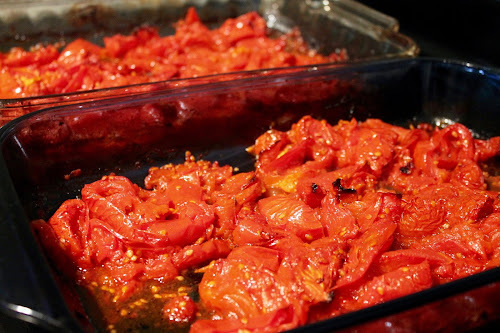 When roasting, you want to roast the tomatoes to the point that most of their moisture has evaporated, but you also have to be careful you don't burn them. Since the risk of doing this increases as they cook, I stir the tomatoes with increasing frequency, one per hour for the first couple hours, then every 30 minutes or so, and finally every 10 to 15 minutes until they are done. They're done when they are very shriveled looking and starting to brown around the edges. Any remaining liquid with be thicker and not particularly watery. It's amazing how much the tomatoes will reduce: 3 lb. 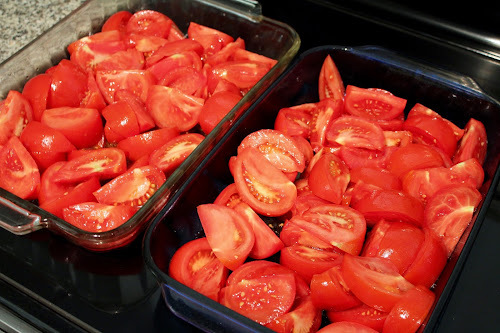 of quartered tomatoes will fill a large mixing bowl, but the roasted end-result is about 1 cup of tomatoes. Some people skin their tomatoes before roasting them, but I don't mind the skins. Roasting tomatoes takes hours, but the dishes you make from roasted tomatoes can cook up quickly, like this spicy Mexican take on a simple pasta dish. I like to roast the tomatoes on the weekend and freeze them in batches, so I have them on hand to use during the week. Defrost the night before and you're good to go. 1. Bring a large pot of salted water to boil. Cook pasta according to package directions 1 minute less than needed for al dente (the pasta will finish cooking in the sauce). Drain the pasta and set aside. 2. Heat a large skillet over medium-high heat. Add the chorizo and cook, breaking up with a spoon, until cooked through. 3. Shove the sausage to the edge of the pan and add the onion and garlic and cook until softened, about 6-8 minutes. Add the roasted tomatoes and stir to combine with the other ingredients. Season with salt, pepper, oregano, cumin and cinnamon. As the mixture simmers, reduce heat to medium. Stir in the pasta and cook an additional minute or two until the pasta is coated with sauce and cooked through but still chewy. 4. 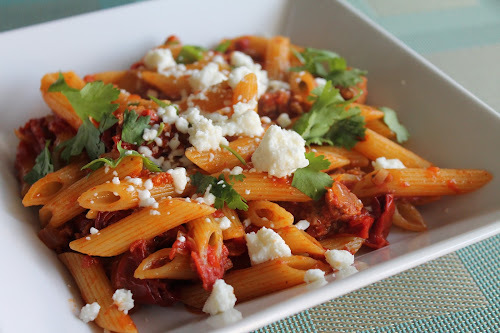 Serve pasta in shallow bowls topped with crumbled queso fresco and fresh cilantro. 3. Bake the tomatoes until they have reduced significantly in size, look shrived and are starting to brown around the edges, about 3 to 3 1/2 hours. Stir every hour for the first couple hours, then more frequently, up to every 10 to 15 minutes when you hit the 3-hour mark, to prevent the tomatoes from burning. 4. When done, remove from the oven, allow to cool, then transfer to a container to store in the refrigerator or freezer until ready to use.